Take a look at our best moments from 2016 put together in a yearbook-style photo book. It’s been a great year for albelli/fotoknudsen/onskefoto/bonusprint, full of exciting changes, lots of hard work but never short on fun. We started the year with a bang with our New Year company party. We donned our best thermals and partied après ski-style. Our catalogue was printed in the summer (followed by one more at Christmas) and we filmed some videos of the making of our products. We launched over 2,000 new clip-arts, backgrounds and masks in both our online and offline creator tools (you can spot some of them in our book below) and produced 90 new pre-designed cards. As if all that wasn’t enough we also managed to find the time for a brand refresh, getting a new logo and a new look. To top it all off at the end of the year we launched our new TV commercial in the Netherlands, Belgium and Norway. Phew. 2016 has been quite a year and we couldn’t have done it without you. Take a look back with us at our best moments in the photo book below. What where your best moments of 2016? 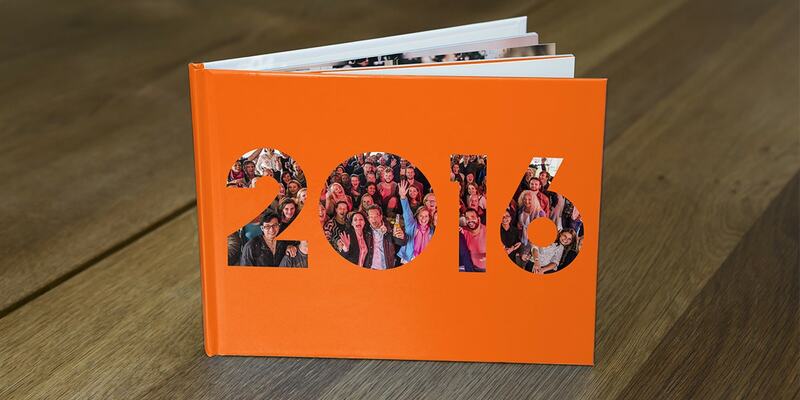 Why not create a photo book crammed full of them just like ours? I doesn’t even have to take long. With the help of our tips you can make your yearbook in under one hour.